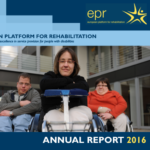 EPR Annual Report summarises the main developments and activities of the organisation over the past calendar year. The publication reviews work undertaken on EPR key activity pillars, sets out the strategic direction of the network and informs about the different management structures. The Annual Report also includes updates on the implementation of the Centre Action Plans and on major events organised throughout the year. The edition reports on the finances of EPR and includes a full description and directory of all EPR’s members. Read our Annual Report 2016 here.